I have to admit that when i was recommended Salta at first, i had high hopes for this place. After all, Argentine food is not something you get everyday. There was a lot of raves about the meat at Salta, which sadly were a complete disappointment. To begin with, the choice of bread served (baguette) was not the best choice they could have made. The bread was hard as rock to the extent the pate served with it couldn't make up for it. We asked for a change of bread but was told that they only had baguette. Later on that evening, the table beside us got served Focaccia. For the first main, we had the Ojo de Bite (Beef rib eye) which was served dry despite our request for it to be medium. The meat was tough and for the price you are paying at Salta, i can assure you that you will easily be able to get a better piece of rib eye else where for the same price (or even lesser). The Costillas de Cordero (Lamb) also disappointed. Although the serving of it was quite generous, the meat lacked seasoning and wasn't at all tasty. In fact, the distinctive lamb smell from the meat slowly hit me while i was halfway though it. Also, point to note also that at Salta, their mains are served with half a grilled tomato and two halves of a mini potato, so don't expect much from the sides. The point they are trying to focus on - the meat, which unfortunately didn't make the mark. The only thing that i thought was not too bad was the Costillas de Cerdo Ahumadas (Pork ribs). The home-made smoked ribs were flavorful, tender and fell off the bone easily. I was hesitant and apprehensive about ordering dessert but we still gave it a go. Unfortunately, the Apple Crepe was served burnt. The Chocolate Cake on the other hand, was not bad, but rather small in portion. To put in bluntly, the desserts did not make up for the mains. While Argentine food may be unique and not common in Singapore, the food at Salta clearly did not make the mark for me. Also, in case you were wondering, the mains will set you back by about SGD 35 - SGD 40 each - yes, for that piece of meat, two potato halves and half a grilled tomato. We also waited 45 minutes for our mains to be served. If you ask me whether i am coming back, the answer is no. And if you are thinking of popping by, i hope the risk is worth taking. It is official - i have a new favorite ice cream place (or in this case gelato, which more or less taste like ice cream). Mezzanotte (pronounced "meh-za-not-tay") lies among a row of shophouses along Upper Thomson. Gelato flavors at Mezzanotte are aplenty. The range include liquor flavored ones like Tiramisu and Malaga (Rum and Raisin), as well as fruity ones like Durian (using D24 quality durian) and Passion Fruit. The Lava Cake left to impress with a warm molten center. It was recommended to go with the Salted Caramel gelato, which nicely balanced out the sweetness from the cake. The freshly made waffles drizzled with chocolate sauce also got a thumbs up from both my partner and me. Not all freshly made waffles are good (some are soft and not crispy because of different types of batter used) but this one was soft and crisp as well. Also, the portion of the waffle was pretty huge as compared to what other places serve. We had the waffles with the Pistachio and Ferrero Rocher gelato, which i was glad were not overly sweet. You can also opt for maple syrup instead of chocolate sauce over your waffles. I left the best for last - a slice of warm homemade brownie with bits of white and milk chocolate chocolate chips topped with my favorite Croccangelo gelato. Croccangelo has to be my favorite flavor at Mezzanotte with bits of sugar coated hazelnuts within the vanilla gelato. Like most ice cream places, you can try all you want before making your decision on which to indulge in. And for a couple of bucks, you'll end up finding yourself in dessert heaven. Also, if all that is still not enough to satisfy that sweet tooth of yours, you'll be glad to know they also have take home size pints for your midnight movie indulgence. CentralWorld is one of my favorite shopping spots when i am in Bangkok - it is the largest shopping plaza and complex in the city. Located at the 7th floor of the huge complex is Nara, a Thai restaurant that supposedly serves up pretty good food for decent prices. We started off with the Nara Platter, which wasn't as impressive as i thought it would have been. In fact, the only thing that was good was the fish cake and fried dumplings. The satay was tough, the pomelo salad was sweet and the spring rolls had a sweet sauce accompanying it which i couldn't quite understand. The Yum Woonsen (Spicy Jelly Vermicelli Salad) with seafood had the right amount of spiciness and zest to it. Overall, i really enjoyed this dish, which was served warm. The Phad Pak Bung (Stir Fried Morning Glory) was mediocre and tasted like any other normal kind of stir fried vegetable you could get at a roadside or local stall. I thought it would be spicier but the sauce wasn't spicy at all despite having bits of chili in it. A Thai meal is never complete without Tom Yum Kung. This one however, also fell short on expectations. The soup was thick, but not spicy enough (it was more sour than spicy). They were generous with the mushrooms but were stingy with the seafood. I felt it should have been the other way round - more seafood and less mushrooms. My favorite dish had to be the Pla Kao Tord Takrai (Crispy Fried Whole Garupa with Crunchy Fried Lemongrass). They fillet the fish for you, making it easier for you to eat. However, there were more fried garlic than lemongrass (which is also why i like it), so don't expect a lot of lemongrass flavor infused in it. The fish was no doubt fresh and the whole dish accompanied with a sour sauce definitely got a thumbs up. The Kao Phad Kung (Fried Rice with Prawns) had plenty of prawns in it. However, i didn't find it exceptionally fantastic and the portion was small - the only thing that probably made up for this dish were the prawns. We ended off the meal with desserts that pretty much made the mark/were on par (finally, after all the inconsistency from the food). The Durian Ice Cream with sticky rice and jackfruit was a different twist from the common mango sticky rice you get in Thailand. 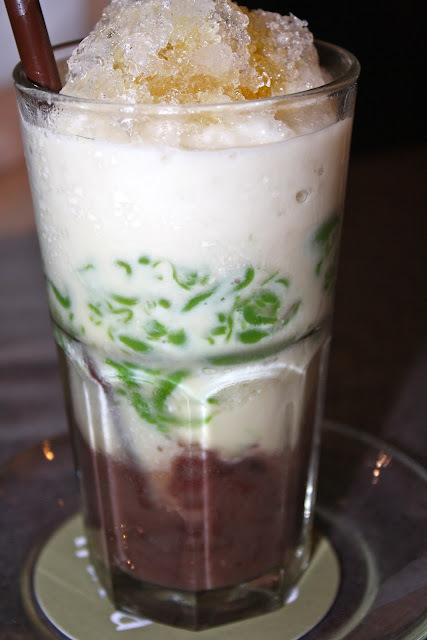 The Lord Chang Nara (a bit like the Singapore Chendol) was also good. One thing i was pretty dissatisfied with at Nara was the service. It wasn't full house that night and the staff there were pretty inattentive. I had to ask for bottle water four times before getting it delivered to me. Prices are pretty reasonable for a restaurant in a considerably high end shopping complex from 140 Baht ( SGD 6) to 460 Baht (SGD 20). But of course, since the food at Nara is not really to die for, i don't think it is specially worth the trip unless you happen to be shopping around CentralWorld.